creek | Toowong and District Historical Society Inc.
Stuart Roden’s family came to settle in Toowong in about 1919 or 1920 when his father Olof Clarence (‘Clarrie’) Roden purchased land at 8 Augustus Street, three doors up from Bennett Street, and had the family residence built on this land. Starting with memories of his childhood home, Stuart recalls nearby local streets and the people who lived here, and concludes at Toowong Memorial Park, the source of many wonderful childhood memories for Stuart. According to McNaughts, our topside neighbours, the 1893 flood just reached the bottom side fence. Extensions were later added to the house. It was the place of birth for all three of us — Clarence James, who was known as ‘Jim’, born in 1921 Stuart (me), born in 1925 and my sister Eleanor Vera, born in 1926. Dr Wheeler, of Sherwood Road, delivered all three. Originally, there was an ‘out-house’ dunny in the backyard. Augustus Street was one of the earlier streets in Brisbane to be connected to the main sewer to Pinkenba. The street was bituminised during the Great Depression by ‘Relief’ workers. The milkman, whose name was Mr Shields, delivered milk in big quart metal pots and pint pot. He had a utility truck covered at the back, with two big milk cans with taps on them and he’d fill our containers. 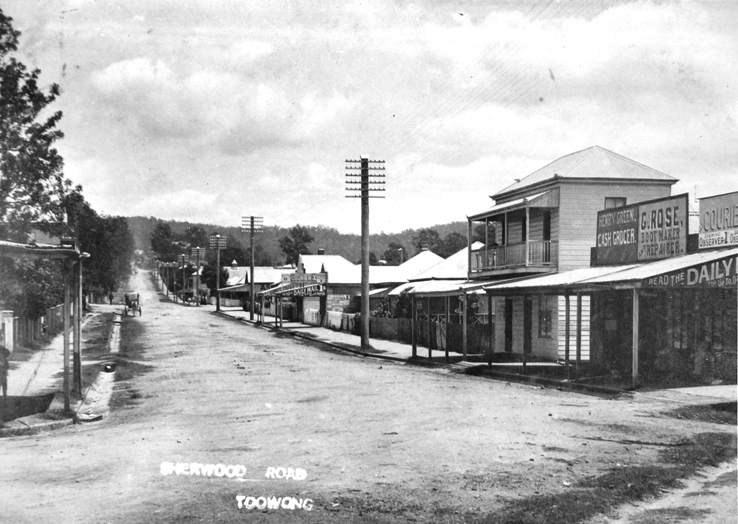 Delungra Street, off the north side of Augustus Street, was an easement which was lined with huge old gum trees on its eastern side and belonged to the Swain family who lived in a large old house down the easement. There was a white picket fence with double gates on Augustus Street. The hearse with the body of the grandfather of my friend, Wally Swain (full name: Walter Edward Swain) came out those gates, probably around 1937. In Golding Street, that part of the street east of Earle Street was opened up in the mid-1930s with five look-a-like houses built on the north side. The area covered by the five houses and the extension of Golding Street was previously a big paddock which belonged to the Swain Senior family. My friend Wally lived in a house on the eastern end of the old Golding Street, on the topside, with their northern fence on what was then a paddock. Cowboys and Indians and building cubby houses out of small trees in the paddock were what sometimes occupied my friend Wally and me. My mother took me to school (at the Toowong State School) on my first day and I was expected to find my way home. But Wally’s mother brought me home on the first day of school (along with Wally) from Toowong State School through their yard, the Swain Senior’s yard, the easement and the double gates on Augustus Street. Wally was a life-long friend until the day he died! He was my best friend at school and later I was his Best Man. Next door, on the top side of Wally’s place, were the Fardons. Then there was a pedestrian lane here between Golding Street and Augustus Street. The lane is now closed. Then there were the Cribbs (he was a dentist); the Steers (and this house was later bought by the McGregor Lowndes) and then Charles Elliott, who was on the corner of Golding and Jephson Street. The latter was a stockbroker. On the right-hand side was the fire station, which I will discuss later. There was an easement from the lower end of the new part of Golding Street to Standring Street, which ran eastward to Bennett Street. Earle Street ran from Golding Street to Sylvan Road. Sylvan Road met Croydon Street at the corner with Church Street (now Jephson) and ran westwards to Milton Road. Just near the corner of Croydon Street on Milton Road was the Elite Picture Theatre where I used to go to the pictures with the family on Saturday nights. My father used to ring up and book our seats and we used to walk down and home again. Your eyes became accustomed to the dark and you didn’t really need a torch. You could see the Milky Way clearly in those days and it was beautiful to see! Lands’ Wholesale/Retail Butcher Shop and Ice Works was on the corner of Earle Street and Sylvan Road. 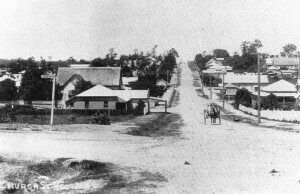 Augustus Street and Golding Street joined Jephson Street, formerly Church Street, as did Sylvan Road, which continued westward to Milton Road near the Brisbane General Cemetery (or Toowong Cemetery).